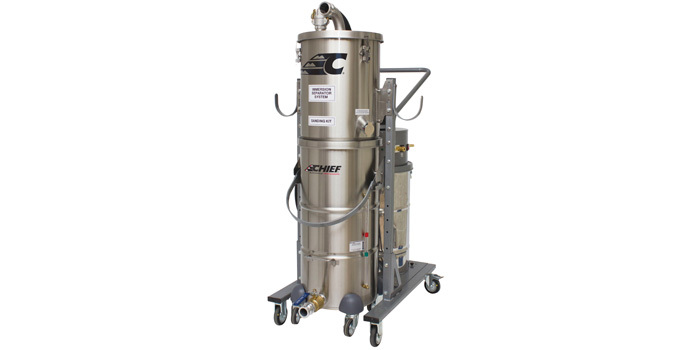 Chief Automotive Technologies has introduced a dust extractor that collects and contains the harmful aluminum particles released when aluminum vehicle body panels are sanded. It features all-stainless steel construction and high-efficiency immersion separation technology, which make it an ideal solution for modern collision repair facilities. Aluminum is increasingly being used in vehicle bodies to save weight. When sanded, it produces dust that can corrode any bare steel it contacts. Aluminum dust is also explosive if a spark is present to ignite it. Therefore, collision repair facilities should isolate aluminum jobs from steel repair, and collect aluminum dust at its source as it’s generated. The new Chief dust extractor is compatible with any pneumatic sander that has a vacuum function. Users simply connect the sander to the extractor via a vacuum hose and air line, and the extractor turns on automatically when sanding begins. To maximize productivity, the dust extractor comes with a wye connector that enables two sanders to connect to it at the same time. As a result, technicians spend less time waiting for equipment. Heavy-duty casters allow technicians to easily move the extractor through the shop. The Chief dust extractor’s water-based immersion separation system wets aluminum particles so they can be filtered into a containment vessel. Unlike traditional dust extractors, the Chief extractor’s containment vessel can be emptied independently of its water tank. This allows users to properly dispose of the collected solids in compliance with environmental regulations, instead of pouring them down a drain with the wastewater. Since hydrogen gas is produced when aluminum reacts with water, the Chief dust extractor’s containment vessel comes with a relief valve. This ensures hydrogen pressure will not build up and damage the extractor. The containment vessel’s HEPA filter captures 99.995 percent of contaminants at .3 microns in size, and the vessel can hold 1.3 gallons of dust before it needs to be emptied. The dust extractor is part of Chief’s new fusion line of products that includes a family of spot and MIG/MAG welders, a new rivet gun and a fume extractor. To learn more about the new Chief dust extractor, contact your local Chief distributor, visit www.chiefautomotive.com/Shop-Tools/Dust-Extractor or call (800) 445-9262. Chief is active on Twitter (twitter.com/ChiefAutomotive) and Facebook (www.facebook.com/ChiefAutomotive). For video, visit Chief’s Vimeo channel, http://vimeo.com/groups/chief.